A couple of weeks ago I managed to steal a couple hours of free time from CC, so we went for afternoon tea at Cakes n Sweets. 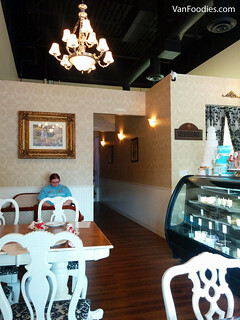 It’s a small bakery tucked in the corner of a strip mall in Coquitlam. It’s my second time for afternoon tea there; first time, I took Mama Lam and we quite enjoyed it. For $19.95 each person receives a selection of sandwiches, sweets, scones and a pot of tea. The Buttermilk Scones were freshly baked. The scones were flaky, slightly crumbly. They were still hot to the touch, so the devonshire cream kind of melted as I spread it on. 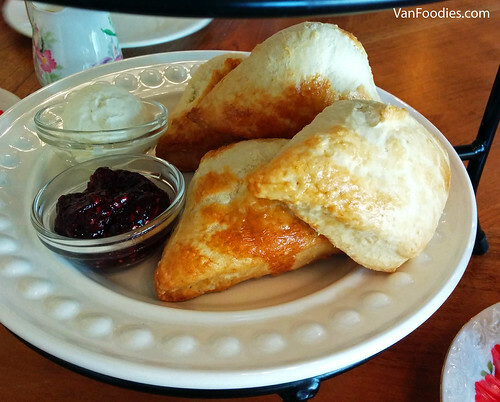 The raspberry jam was just another classic way of enjoying these scones. The Smoked Salmon was turned into a pinwheel form. It’s creamy with plenty of smoked salmon in each bite. I really liked the Cucumber sandwiches. The lemon came through so there’s a nice tang, and the cucumber slices were fresh and crunchy. The Egg Salad paired with the buttery croissant was rich and satisfying. 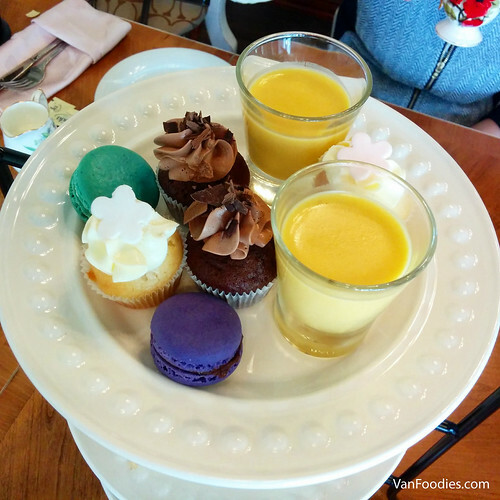 We ordered Earl Grey & Lavender Macarons, and the lavender one was better. Flavour was more prominent and the texture of cookie was better, less crumbly and still chewy. Mini Cupcakes were chocolate & vanilla. The cupcakes had good texture and the buttercream was well made. The Mango Pudding was more of a standard affair for me. They used to serve Panna Cotta and I actually preferred the Panna Cotta over this. As for tea, I ordered the Raspberry Honey and I thought it’s quite nice. It’s fruity, not really tart as I imagined, and there’s a subtle hint of honey flavour as well. 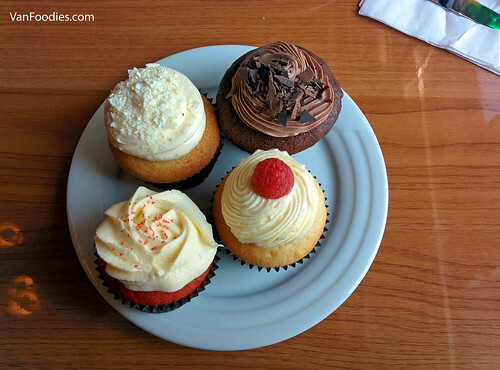 In addition to afternoon tea, I’ve also tried their cupcakes. The texture was very good, soft and moist and not crumbly. Flavours were also prominent. I especially liked chocolate and lemon, while Mr. liked its red velvet. In fact, we liked their cupcakes so much we got our wedding cake here! 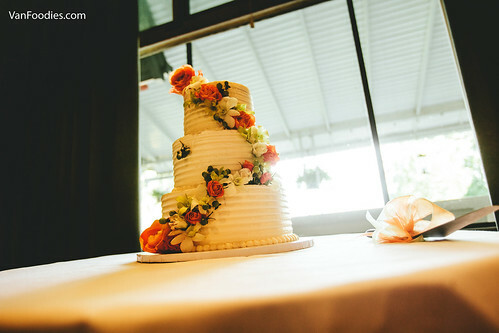 Last summer when Mr. and I had our wedding, we ordered a 3-tier cake from Cakes n Sweets, two layers of lemon and one layer of red velvet, decorated with buttercream and fresh flowers. Guests were very happy with the cake. We were very happy with this pretty cake! 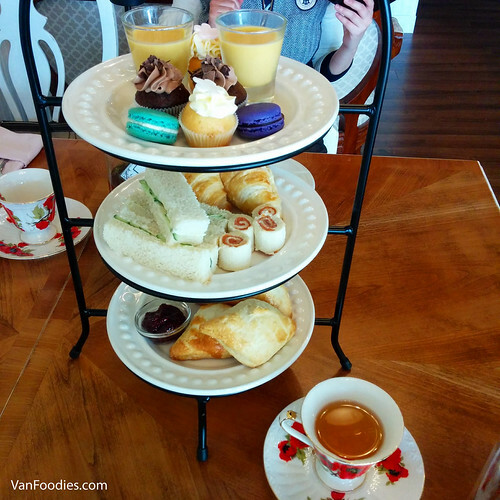 For $20 per person, afternoon tea at Cakes n Sweets is a steal! There was a generous serving of everything and all items were done well. 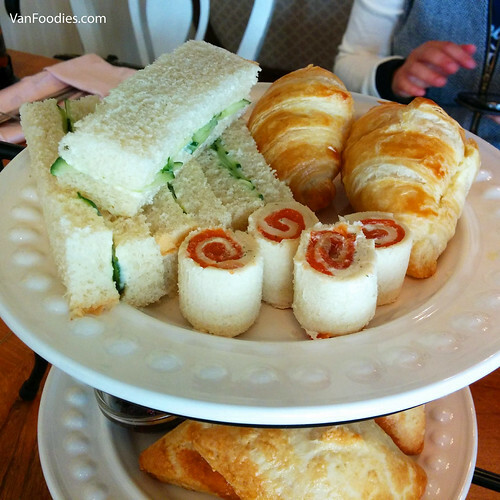 When I went with Mama Lam, we actually couldn’t finish everything and had to pack some scones and sandwiches home. This time around we finished everything but just barely finished it all. Overall, food is great here and service is friendly. They also do custom cakes (like our wedding cake) and you should check out its Instagram. 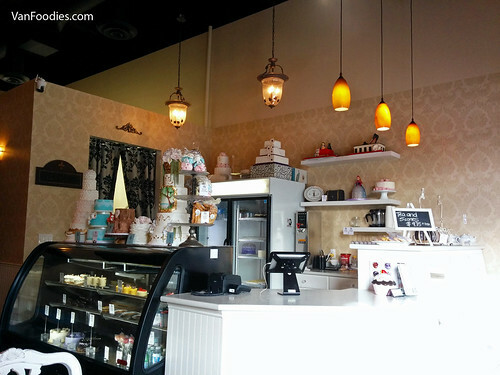 It’s such a hidden gem in Coquitlam and I would love for more people to know about them!